In 2007 Aquabee who supply pumps to Deltec for use on various pieces of equipment changed the design of the pumps from the traditional impellor design with removable shaft and fixed bearings to a newer design with the ceramic shaft fixed to the impellor and running on ceramic sleeves within the pump. 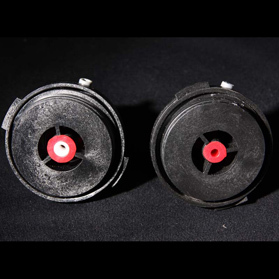 The main reasons for this, was to have a smoother running pump and to eliminate the problems that rubber bearings bring – such as shrinking or hardening off and then causing noise and vibration within the pump. With the new designed pump and impellors coming into the market place, this has created the problem of old style parts being incompatible with the new style fitting and pumps. The old style impellors will not fit into a new style pump and the other way round. If you have an old style pump and the pump stops working then you would have to buy a stator which is just the motor casing without any additional fittings. The reason you would only buy a stator is because you would already own all the other parts required to rebuild the pump and get it going again. Unless you require a new impellor for example then this is the cheapest way to go for the hobbyist and is why we sell stators on their own. Also the old style impellor housing plates are the same as old style fittings and will not be compatible with new style fittings. If you own an old style pump or require an old style fitting these parts can be easily supplied via spares@theaquariumsolution.com , but you need to be aware that when ordering parts is your pump or fittings the old style or new style type. Most pumps supplied from 07 onwards will be of the new style design, however some retailers may have old stock and you may have purchased an old style pump within a skimmer or other motorized piece of equipment. The easiest way to identify if you have an old style or new style is to take a look at the impellor. On the old style models the impellor will have a ceramic shaft that can easily be removed from the impellor by simply sliding it out. Also the ceramic shaft will be held in place by a rubber bearing each end of the shaft. These bearings may be black or red depending on which piece of kit they are from. On the new style pumps the ceramic shaft is completely fixed onto the impellor and cannot be removed. Do not attempt to remove this as it may get broken and result in you having to buy a complete new impellor! The ceramic shaft does not have any bearings on the ends as each end slides into ceramic sleeves fitted in the bottom of the pump and in the impellor housing plate that is twisted off to remove from the pump to reveal the impellor and chamber. 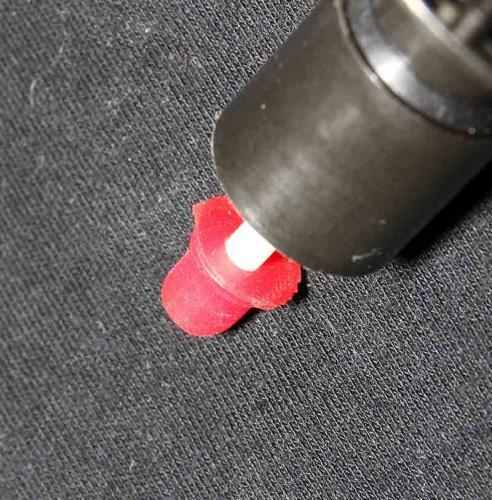 The new style pumps will have fitted a red rubber bearing with a ceramic sleeve top and bottom of the pump. One is located right inside at the bottom of the pump chamber and the other located inside the impellor housing plate that is removed from the pump. This will also identify if the pump is of the new style model. If you require spare parts then it is important to know whether you have old or new style pumps and fittings. When ordering please inform your retailer or our spares department which you will need. This helps to get the correct parts to you and avoid any issues etc in the future. On the left is the new style clearly showing the ceramic sleeve, and the one on the right is the old style. The old style does not have any ceramic sleeve fitted. On the old style pumps it is possible to purchase just the ceramic shafts if you happen to require one due to wear or it gets broken. It is not possible to buy just the shaft on the new style impellors as they are full fixed in place and cannot be removed. Equipment that is affected by the pump changes are mc500, mce 600, ap525,600 and apf600 skimmers. Any skimmer with an Eheim pump is not affected by these changes. All nitrate filters and calcium reactors and any other items fitted with an Aquabee pump, such as type 35 filters. 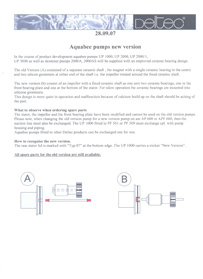 Also stand alone submersable pumps from the Aquabee range have also changed impellor design. 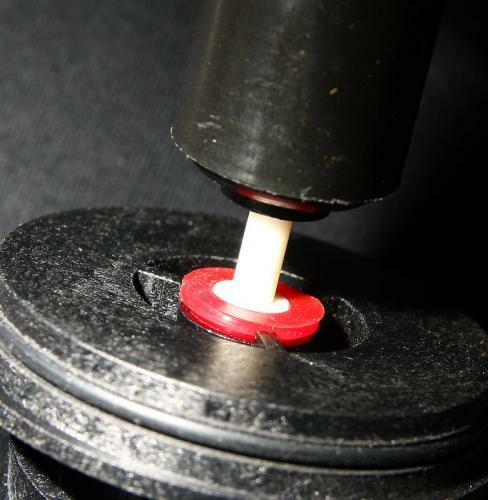 This image above shows how the new style ceramic shaft fits into the ceramic sleeve on which it rotates on. The complete shaft and impellor will rotate together unlike the old style where only the impellor rotates but the shaft stays fixed. Hope fully this article will make things clearer, but if you are not sure please ask before ordering any parts you require. When ordering replacement Aquabee pump parts from D-D for your Deltec equipment please refer to the following Deltec product info sheet (below) to identify the correct part that you need. The old style impellers with the separate shaft will not fit the new style pump stators that are supplied with impellers with intergrated shafts and visa versa. The new pumps will have the numbers '07' or the words 'New Version' as part of the product code found on the rear of the pump block(stator). Please also note that in some cases the new pumps will not fit Deltec equipment supplied with old styleAquabee pumps without new pipework, please refer to the info sheet below (pdf will open in a new window).